Toasted Marshmallow Berry Bites are a perfect and easy dessert! Made with Fiber d’Lish Chocolate Brownie as the base instead of graham cracker or cookie for added fiber! This ooey gooey dessert is a sweet and easy treat to make any day of the summer (or any time at all)! Roast marshmallows until they are toasted. 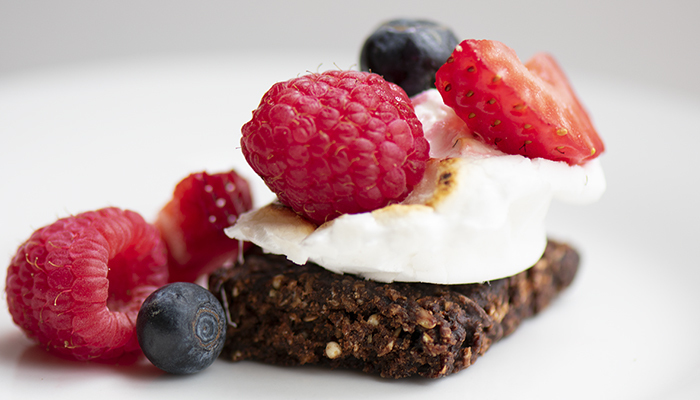 Cut your Fiber d’Lish Chocolate Brownie Bar in half and heat for 20 seconds in microwave. Top the bar with a marshmallow and fruit. Eat Immediately!